The maritime heritage of Penzance is centred on its harbour which has, for hundreds of years, provided the lifeblood of the town. Along with Newlyn - just a mile to the west - it is the first secure harbour and anchorage on the coast of the English Channel on entering from the Atlantic Ocean, Penzance harbour had a long trading tradition. Today, the harbour provides both a commercial and a recreational service to the town, although trading by sea has long declined in the face of efficient land-based transport. Day-to-day operation of Penzance harbour is supervised by a Harbourmaster, whose offices are directly on the quay. There is a gated, inner harbour or Wet Dock for commercial use by fishing and similar vessels and by other deeper draft vessels. The Gate to the Inner Harbour is open to the sea at every high tide. It is open from two hours before until one hour after high tide. The Harbourmaster's office is manned during this time. Located in a tidal basin of the harbour is a dry dock and shipyard for service and repair to coastal shipping and small naval vessels. Regular passenger services are maintained to the Isles of Scilly by the Isles of Scilly Steamship Company throughout the summer season - from March to October carrying both day-visitors and holiday tourists to the Islands. A freight service to the Islands is also operated year-round by the Company from the harbour. 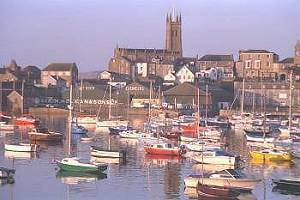 Facilities are available for visiting yachtsmen and recreational use of the harbour is made both by Penzance Sailing Club and Penzance Sub-Aqua Club who each have clubhouse premises on the quay. Re-development plans for Penzance harbour are proposed which will add significant new facilities for users of all types of craft.